All important data are password protected. So it is highly important that passwords might not be cracked with least effort. Secure password should have a minimum length of 8 characters, they should consist of lowercase and uppercase characters as well as of numerics and special chars. But these passwords are difficult to remember. The consequence is that we tend to use simple and short passwords. Often prenames of family members. But such passwords are easy to encrypt. Enter data by mouseclick into target fields(no typing). 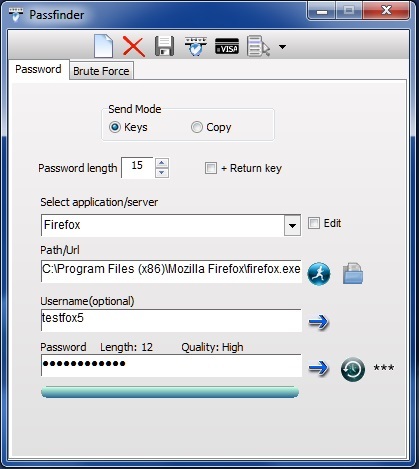 Passfinder can demonstrate the brute force technique e.g. for your members of staff to show how vulnerable simple passwords are. So the tool may be especially interesting for it-officers and data protection officers. For example a 5-digit password of lowercase characters will be detected within seconds by any standard desktop computer. Passfinder provides a feature to recover your forgotten password from MD5 key. That means you need the MD5 key of your password. Depending on the complexity of the password recovery may take a long time or might not be successful in reasonable time.